The Minocqua Area boasts a rich logging history. Primitive, roughly constructed dams were built in the mid 1800s to back up water levels on area chains of lakes to form waterways for the conveyance of timber. The vast woodland area was viewed as an inexhaustible forest by loggers arriving at the turn of the century to harvest the wealth of timber. In the 20-year period between 1890 and 1910, loggers cut nearly all the pine and hardwood forests of the north. 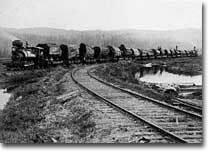 Railroads were forged to speed the harvest and mill towns sprang up in the virgin wilderness to process the wood and cater to the loggers. Minocqua, Arbor Vitae and Woodruff were three such towns, rising out of nowhere in what seemed like an instant. In 1887, the Chicago, Milwaukee, St. Paul & Pacific Railroad Company completed its main line north to Minocqua in order to open up additional tracts of lumber. The railroad's arrival brought a variety of individuals - those seeking work in the logging camps and those hoping to establish businesses or provide necessary services. As the community took form, a more stable population took up residence, with mill hands who generally worked year-round, replacing lumberjacks. Woodruff was platted a year later by Alfred L. Cary, serving as general solicitor for the Milwaukee, Lake Shore and Western Railway Company. Cary represented the legal interests of the railway's expansion north from Rhinelander. He bought land and maintained the timber rights to much of the property in Woodruff. Although officially platted in late 1888, there were settlers prior to that year. Railroad construction crews, land speculators, "squatters", and men looking to make their fortune in pine were surely among the early residents. In the early 1890s, Ross Lumber Company built a mill in Arbor Vitae and employed 400 men. The town included a rooming house, large general store, a three-story hotel and 50 houses for the mill workers. The mill ran day and night and manufactured all kinds of lumber, lath and shingles. Arbor Vitae was a boom town then with many social events including dances, masquerade balls, and baseball games on a weekly basis. Today, the remaining abandoned railroad right-of-ways and extensive network of old logging roads provide an unusual and fascinating trail system which is used during the winter for snowmobiling and spring, summer and fall for hiking and biking. Approximately 95% of all the land known as the town of Woodruff and 80% of Arbor Vitae is owned by Federal, State and County interests and is not available for private sale, ensuring an enviable recreational environment for all future generations. The natural resources of the area are managed by the Department of Natural Resources for the benefit of public and private enterprises. Canoeing and kayaking have become increasing popular, and with the abundant water bodies there's no better place to do it. Head out on your own or hook up with a guide and enjoy peaceful (or adventurous) paddling! There's no better way to fully appreciate the splendors of nature in the Northwoods than by hiking and biking its back byways. A number of trails provide an opportunity to view wildlife native to Northern Wisconsin in their natural habitat. Always keep your binoculars and camera ready - you never know when you might see a bald eagle, porcupine, raccoon, deer, loon... whether it's by foot, bicycle, boat or vehicle, taking in the beauty of the Northwoods' environment is Good For Your Soul. Beauty comes in many forms in the Northwoods: a wilderness lake surrounded by tall white pines whose needles comb the winds; a tamarack bog that turns dusty gold in October; a quiet river that winds through marshes clothed in the colors of white and yellow water lilies; a forest trail that when hiked on a early June morning, yields a tabernacle of bird song; a dark lake where loons wail heavenly across the water; or the morning after a heavy snowfall when the balsams are bowed low and there is a quiet upon the landscape that is tangible. The land and waters of the Lakeland area support exceptionally rich communities of wildlife and plants, some of which are threatened or endangered. Vilas and Oneida Counties have the highest populations of nesting bald eagles in Wisconsin, with 83 and 74 nesting pairs respectively. Several areas concentrate eagles and osprey in remarkable numbers, like the Rainbow Flowage which provides habitat for 13 pairs of osprey and five pairs of eagles along its shoreline, and the Willow Flowage which supports ten pairs of osprey, and eight pairs of eagles. A dawn canoe trip on either flowage often provides a dazzling array of sightings. 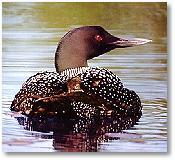 Vilas and Oneida Counties also lead the way in numbers of loons in Wisconsin.Vilas and Oneida Counties have hundreds of lakes where loons actively nest. The mid-June hatchings of loon chicks are probably as avidly awaited by loon lovers as by the adult loons. If you desire remote untouched areas, 19 wilderness lakes have been preserved with undeveloped shorelines and no road access, like pristine Salsich Lake near the town of Star Lake. Forty-one wild lakes, like Allequash Lake and Escanaba Lake, are still undeveloped but have road access, and offer beautiful settings for quiet recreational use. Fourteen state natural and scientific areas, exemplified by the old growth forest of the 561 acre Star Lake - Plum Lake Hemlock Natural Area, have been set aside to be used only for nature study, educational purposes, and aesthetic appreciation. Many residents and visitors not only love the beauty and peacefulness of the area, but want to understand more about the flora and fauna that live here. A walk in the woods or a canoe trip can be all the more enjoyable with a knowledge of how to identify the many species encountered, and a perspective on what each species' role in the ecology of the area. The study of the natural world is a lifelong endeavor that yields continual surprises and pleasures. Beach it at one of our wonderful park facilities! You'll find a soft, sandy beach and roped swim area at Torpy Park in Minocqua with full-time lifeguards on duty from June through September. Public men's and women's restrooms and showers are available, as well as public tennis courts, playground equipment, picnic tables and grills. Brandy Park in Arbor Vitae similarly has a well-maintained beach, lifeguards, public restrooms, pavilion, picnic tables, grills and tennis courts. Off water, the vast woodlands of the Northern Highland-American Legion State Forest beckon campers and naturalists with secluded campsites, self-guided nature walks, hiking and biking trails and wildlife sighting excursions not to be equaled. A day's activities can vary from nature hikes and llama lunches to casino gambling and sunset dinner cruises. Visit the many attractions which include miniature golfing, go-carting, water sliding or petting zoos. Browse the unique shops or search for that hard-to-find antique. Each weekend offers a new and exciting tournament, festival or arts & craft show -- plan ahead to make your trip during one of these special events. Pack a blanket or lawn chair and take in a free concert on select Thursday evenings at Torpy Park, downtown Minocqua - Lakeland Community Concert Band, German Band and Celebration Brass Quintet. Call the Chamber for dates. 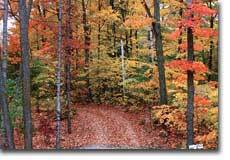 Several beautiful fall color driving tours are available at the Chamber office. Remember to check our Fall Color Report, updated each week from early September through mid-October, which indicates the percentage and quality of color of our area's trees and when we'll reach peak colors. Generally, peak colors can be seen anywhere from the last two weeks of September to the first two weeks of October. Visit us during our 36th Annual Beef-A-Rama / Colorama, September 30, 2000, to experience the sights, sounds, and smells of roasting beef throughout the Lakeland area, while enjoying the beautiful fall foliage. Capture the breathtaking beauty of the bright reds, vivid yellows and warm oranges reflecting off the the sparkling water or arching over rustic roads. Grab a water bottle and, pack a lunch and set out to get up close and personal with nature and our native wildlife along the hundreds of miles of hiking and biking trails. R58 Location: Oneida County Blue Lake Road, west from US 51 to Mercer Lake Road, and Mercer Lake Road north from Blue Lake Road. 9.6 miles. Paved. R59 Location: Oneida County Sutton Road and Camp Pinemere Road between WIS 70 and Blue Lake Road. 4.5 miles. Gravel, gravel & sand and paved portions. Nature lovers revel in the silent monochromatic world of winter in the northwoods. Thousands of visitors come each year to enjoy the bounteous snowfall, an average of 65" per year, and dense, frozen lakes. Snowmobiling and skiing are at their best, and ice fishing hot spots are infinite. For additional outdoor fun, don't forget ice skating, sledding, snowshoeing, sleigh riding, and more. Located on Highway 70 West six miles to Squirrel Lake Road, then six miles to Scotchman Lake, Minocqua Winter Park is considered one of the top cross-country ski areas in the United States. Seventy-five kilometers of snowcat groomed trails -- 65 km for skating and striding and 10 km for striding only -- entwine through wooded terrain that varies from flat to hilly. More than 2 km of lighted trails provide skiing on scheduled nights, and two groomed telemark slopes allow for turning practice. 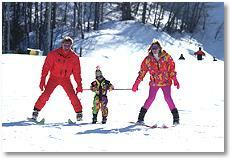 A snowshoe trail, rentals, and instruction are also available at Winter Park. The Day Lodge at Minocqua Winter Park offers everything a skier requires: a warm place to relax, food service, restrooms, waxing room, ski patrol and baby sitting. 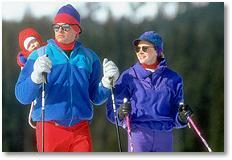 The Ski Shop offers full retail, up-to-date rentals and PSIA certified instruction. Hours of operation: Saturday - Tuesday: 9 am - 5 pm / Thursday and Friday: 9 am - 9 pm. / closed Wednesday (715) 356-3309, (715) 356-1099 (ski shop). Enjoy 35 Km of scenic, wooded X-C ski trails in the dependable "Snow-Belt." Afforadable rustic trailside lodging, lessons, P.B. grooming for skate skiing and diagonal & snowshoe trails. Call for honest conditions 906-932-3502. E-5299 W. Pioneer, Ironwood, MI 49938. McNaughton - 10.0 mi 13 miles south of Woodruff on Hwy 47, then west on Kildare Road. Raven - 11.0 mi 2 miles southeast of Woodruff on Hwy 47, then north .5 mile on Woodruff Road. Schlect -10 km Leary Road, 1.5 miles south of downtown Minocqua off Hwy 51. Lumberjack - 12.5 mi Has 2 parking lots. take Old K east of Boulder Junction to Concora road, or take Hwy M to Hwy K east 5 miles to Nixon Lake Road. Powell - 8.5 mi 8 miles southeast of Mercer, take Hwy 47 to Powell Road, then 0.56 mile north. Shannon - 7.0 mi 2.75 miles north of St. Germain on Hwy 155 to Lost Lake drive S, then 1 block north to Found Lake Road, then 2 miles to trail head. Statehouse Lake - 2.9 mi From Hwy 51, turn east on Cty Hwy W, Manitowish Waters, then 1.5 miles to North Lakeland Discovery Center. Trail maps for Minocqua Arbor Vitae Woodruff area are available at the Chamber office or can be mailed to you provided a S.A.S.E. and map request note is sent to us. Please contact us for postage fees and envelope size. Lakeland Ice Arena - Indoor ice rink open to the public during scheduled times. (715) 356-6762. U.S. Hwy 51 South to Northern Road to Old Hwy 51, follow the signs. Torpy Park - Outdoor public ice rink, lighted. U.S. Hwy 51 South, downtown Minocqua. Brandy Park - Outdoor public ice rink. U.S. Hwy 51 North, one block north of Hwy 51-47 stoplights on Lemma Creek Road. P.O. Box 1161, Minocqua, WI 54548 Come ride away from the crowd on 190 miles of Bombadier-groomed trails, extending to the Willow Flowage and Price County. Food and gas are available throughtout our trail system. P.O.Box 733, Woodruff, WI 54568 cruisers@nnex.net The Cross Country Cruisers maintain 135 miles of Wisconsin's most scenic and best groomed trails in and out of Arbor Vitae, Woodruff & Minocqua. We are 28 years old and are the 4th largest in Wisconsin. Join our club and help support the sport! Only a $25 a year membership in both the Cross Country Cruisers and the Association of Wisconsin Snowmobile Clubs (AWSC). P.O. Box 45, Lake Tomahawk, WI 54539 The New-Tom Sno-Fleas have extensive snowmobile trails south of Minocqua. Lake Tomahawk is the center for going North, South, East or West. We are known for keeping our trails in great condition especially with the addition of our new equipment. 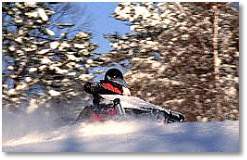 New Wisconsin law, instated May 1, 1998, requires non-resident s who use Wisconsin snowmobile trails to display either Wisconsin registration or a non-resident snowmobile trail use sticker. The sticker is $13 and may be purchased at any business that sells state licenses (such as hunting, fishing, etc), or the DNR offices. Further information can be obtained by calling (608) 266-2621. For an area that has a total year round population of well under 15,000, Minocqua-Arbor Vitae-Woodruff offers an impressive and varied number of exciting attractions. Children can enjoy close-up wildlife encounters at area zoos or opt for a thrill-a-minute afternoon of go kart riding, bumper boating and water-shoot sliding. The entire family can challenge each other to a round of miniature golf at several different courses or sit back and relive the logging days of yore at live, breath-taking lumber jack competitions. Local water skiers delight everyone as they perform their skillful maneuvers and an afternoon or evening of summer theater is not to be missed. Culture buffs will want to browse in our area museums. Try you luck gambling at our local resort/casino. Everyone will want to take a cruise on the nature-filled wilderness waters of the vast Willow Flowage. Free Min-Aqua Bat water ski shows each Sunday, Wednesday & Friday, mid-June through mid-August, on lake Minocqua (Park Street West, downtown Minocqua). Enjoy 35 Km of scenic, wooded X-C ski trails in the dependable "Snow-Belt." Afforadable rustic trailside lodging, lessons, P.B. grooming for skate skiing and diagonal & snowshoe trails. Call for honest conditions 906-932-3502. Scenic, narrated cruises. Island shuttles, lighthouse cruises and tours, schooner sailing, kayak rental, evening cruises, May - October. Family fun! Educational northwoods experience. Rain or shine. Gift shop, free games and more. Water slide, go-karts, bumper boats, trail & train rides, miniature golf, batting cages, pony / kiddie rides, splash area. Manufacturers of all natural vitamins & nutritional supplements for over 35 yrs. Open for free tours. Three go-kart tracks, horseback riding featuring family trail rides, pony rides, & game room. 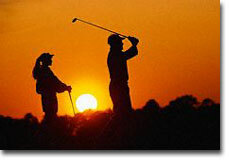 18 challenging holes conveniently located in a beautiful downtown Minocqua setting. Lots of fun at a reasonable price! Professional theater producing musicals, comedies and children's theater. May thru October. Call for time and schedule. Visit a real wildlife hospital! Take a guided outdoor tour. Open year round, closed Sundays. Feed exotic & North American animals. Pioneer Village, Safari rides, X-C skiing, snowshoeing. Gift shop. A 20 acre outdoor recreated Indian village on the Lac du Flambeau Reservation. Public & private guided tours. Large arcade, miniature golf, soda shop, craft mall, deli, ice cream! Open daily year round. 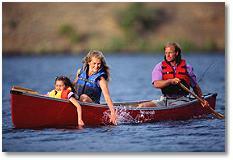 Sightseeing, brunch and dinner cruises on the pristine Willow Reservoir. All cruises narrated. May-October.